A day in the life of 17-year-old twins Jane and Roxanne Ryan, New York Minute follows the two girls as they deal with various mishaps along the way. 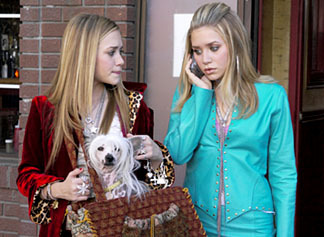 Mary-Kate and Ashley Olsen basically play themselves, and get to dress up a lot. Great. Jane is every parent's dream: responsible, reliable, smart and hoping for a scholarship to Oxford University. She dresses conservatively and is soft spoken. Each morning she rouses her sister, makes coffee and prepares breakfast for their father, a doctor. Since their mother has died, she has taken the responsibility of running the house on her shoulders and never lets her sister forget it. Roxanne is a musician of sorts, meaning she bangs around on a set of drums for a few seconds to make us believe she's a drummer. She's constantly skipping school, dresses like Avril Lavigne and keeps a boa constrictor as a pet. Basically, she's the exact opposite of her sister. Since they both need to go to New York  Jane to present her carefully prepared Oxford dissertation and Roxanne to attend a video shoot and promote her band  they decide to travel together. Things fall apart as soon as they get on board the train. Mix in a misplaced microchip, a truant officer obsessed with catching up with Roxanne and a couple of cute boys and you have yourself a movie. Sort of.